36th match of ICC Cricket Worldcup 2015 has been played between South Africa and UAE at Westpac Stadium, Wellington today. South Africa with superb batting performances of skipper AB de Villiers 99 and F Behardien's 64 runs of just 31 balls put huge totals of 341 runs at the end of 50 overs. UAE all out scoring 195 runs and lost the match by 146 runs. AB de Villiers (South Africa) declared man of the match for his 99 runs and picked-up 2 wickets. Earlier, United Arab Emirated won the toss and put South Africa into bat first. South Africa lost inform batsman HM Amla early scoring just 12 runs. Q de Kock and RR Rossouw played sensible cricket and contributed 26 and 43 runs respectively. 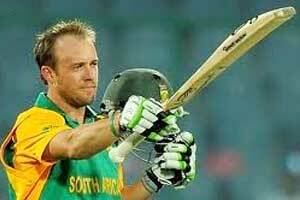 In middle overs skipper AB de Villiers joined with DA Miller and took charge in hand with splendid batting performances. DA Miller made useful 49 runs and skipper contributed very well 99 runs of just 82 balls. In later overs F Behardien played quick inning of 64 runs of just 31 balls and put South Africa on huge score of 341 runs at the end of 50 overs. Following huge target of 342 runs, United Arab Emirates could not batter start and at stage of game UAE were 45/3 in 11.4 overs. Shaiman Anwar took charge in hand and playe as usual good inning of 39 runs before he lost his wicket. Other middle and lower order batsmen could not stood in middle for long and lost wickets in regular interwals. UAE all out scoring 195 runs in 47.3 overs and lost the match by huge margins of 146 runs.